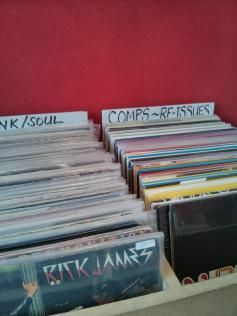 Here is a selection of stores for vinyl records in Saint-Ouen flea market. Rediscover the pleasure of the warm sound of single, maxi or long playing vinyls. Older people certainly remember poor quality pirated records, 3rd generation audio tapes and other bootlegs they bought at flea markets. Times have changed. Today, vinyl record lovers have to pass by Saint-Ouen flea market to complete their record collection: French light music, rock, punk, jazz, hip hop, blues, world, black music, coldwave… You will find shops specialized in the sale of records covering all international music styles in several places in the flea market. There is something for everyone and in all price ranges: inexpensive used singles or collector’s albums. Go hunting for rare vinyl records with the help of the record shop owners; in the age of digital music, you will have to rummage in these shops to find that rare pearl. There are many record shops in Saint-Ouen flea market. If you are in a hurry, go straight to the second floor of Dauphine market or rue Jules Vallès. > Record Day in Paris is celebrated on April 21st! This shop is located on 52 rue Jules Vallès. It is specialized in American records and offers a wide range of musical trends: soul, funk, reggae, salsa, pop… Copa Music also buys your vinyl records. You will find a large range of vinyl records or tapes at Alto blues: old records dating from just after the war or very recent music. Alto blues is located on 10 rue Jules Vallès. This English record shop is located on the first floor of Dauphine market. It sells very rare records : reggae, ska, rocksteady, dub, drum and bass like the “virtually impossible to find” Megaton Dub Vol.1 and Vol.2 by the jamaïcan Lee Perry. Two turntables are available to listen to the records. Looking for Stevie Wonder? Other record shops are not far: don’t miss shops 214 - 215 - 216 which are also located on the first floor of Dauphine market (allée Cézanne).